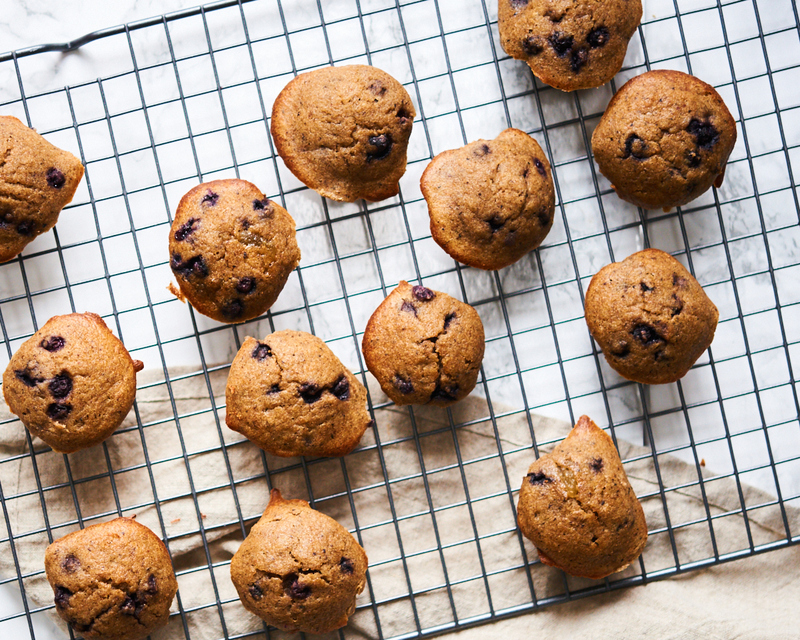 Ever crave a muffin in the morning that’s perfect for breakfast but not too sweet? We are always trying to find recipes for baked goods that won’t give us a sugar rush or that shaky feeling that comes from eating something too sweet for breakfast. This recipe is a lovely combination of spelt, oat and buckwheat that creates a flavourful, rich flour that’s also still fluffy. Buckwheat is a gluten free flour that we love to bake with, but it is very dense when used on it’s own. That’s why spelt flour and oat flour give the muffins a better texture. You are going to love the bite of candied ginger in these muffins, it pairs beautifully with the familiar sweet taste of banana and the fresh pop of blueberries. Mix the wet ingredients together. Fold in the dry ingredients. Then stir in the blueberries and chopped candied ginger. Portion out into a mini muffin tin, lined with muffin liners. Alternatively, you can bake in a normal sized muffin tin. Bake at 350 for 25-30 minutes, until cooked through and knife or toothpick comes out clean. If you’re making larger muffins, they might take a little longer to cook in the center.